2) Father's Day Gifts are Hilarious: Whether you feel the need to celebrate or not, you will ultimately see a FB post or ad pop up of some silly Father's Day gift. Honestly, I probably just spend too much time on the Internet, but every time I see a pair golf boxers for dads it makes me chuckle. I mean, there have to be other hobbies out there for men besides golf and fixing things. 3) Short Lines: This is really more of a 2a. Along the lines of gift giving, have you been to a retail store/restaurant/Dollar General on Mother's Day? Doing anything for Mother's Day has to be done at least a week or two in advance, and will cost you a fortune. Remember how I said there are like ten gifts marketed on Father's Day? Yeah, maybe 3 people will buy them, so if you want to be number 4 there is no wait. Laid back vibes and celebrating the father figure in your life naturally go together in my opinion. Again, if you are still anti-Father's Day, think of all the places you can still go to brunch and enjoy. Try going ANYWHERE on Mother's Day if you don't have a mom to celebrate. You will end up back at home with tissues watching Mommie Dearest. 4) TV Dad Marathons: Regardless of if you have a dad or not, pick a TV dad for the day and laugh until you cry. James Evans Sr. is my absolute favorite TV dad. 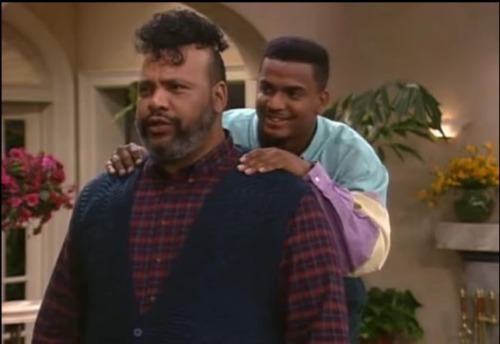 Besides holding it together on Good Times, he kept popping up as other people's dads in the 90s. Every time he did it was awesome. Coming in second place, Bernie Mac. TV shows about the American family are so plentiful you have a ridiculous amount to choose from. If you are fortunate enough to have cable, I feel confident in saying TVLand is running The Cosby Show. If you are like me, hop on a free Hulu Plus trial, Netflix, or Project Free TV to catch your show of choice. 5) It's Honest: Father's Day receives a lot of bashing. It seems to be the only holiday it is acceptable to not like, meaning, people get real. You see who is still upset about what is or never was, but then you see people who are truly grateful about what is or never was. I have no clue who my biological father is, but I have had a dad all my life, and he helped me to be pretty awesome. I don't think about what could have been or who some other person might have been. After 25 years, it's irrelevant. Today, I think about my dad, my uncles, the male teachers I have had and all the men in my life who have showed me what I do and don't want in life, of myself, and in a partner. I am thankful. Tyler Perry has not received any financial support from me since 2008, but in a bootleg copy of Madea Gets a Job, Madea confronts a young man, who is now successful, but still upset that his dad wasn't there, and goes "Maybe he wasn't supposed to be there. Look at you and look at him." *Laughter from the theater audience. Life is messy, but getting mad about things outside of your control hardly does anything for anybody. Part of being a strong woman is loving and healing- be it missing fathers, mothers, or some fool that said you weren't pretty- and developing into a woman that inspires others. Be well.